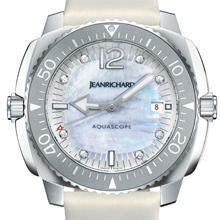 The origins of the JEANRICHARD Aquascope date back to the 1960s, when the Brand was making a name for itself with its diving watches. Although retro-inspired, the model boasts a resolutely contemporary character. It has taken centre stage with a seductive piece created exclusively for women. Following on from the Aquascope Lady Night, whose femininity was underscored by an intense black, the Aquascope Lady Day opts for the purity of white. A subtle harmony of nuances and light effects enhance its brilliance: the iridescent mother of pearl dial features eight diamond hour markers, reflecting the strap's satin-finished sheen. 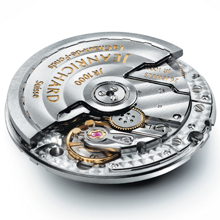 The steel case is embellished with an aluminium rotating bezel with a polished satin finish. 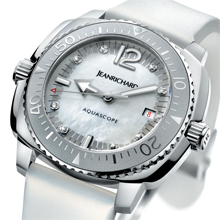 The Aquascope Lady Day meets all of JEANRICHARD's traditional requirements in terms of accuracy. This diver's watch is therefore equipped with the JR1000 automatic winding calibre developed and produced in the Brand's own workshops. The case, also developed and produced in-house, is water resistant to 300 metres and equipped with a second screw-down crown which allows the bidirectional rotating bezel to be turned in order to measure the dive time.